Police dog (Cop Kutta) City crime chase sniffing simulator game, The security of the City is in your hands now. Here we are with a real police sniffing dog chasing criminals and terrorists in one of the solitary police crime chase games having the concept of police vs thief and police dog games with top police chase stirring missions. So get ready to start the full throttle action with a police dog chasing criminals in one of the brand new police dog games with police chase games thrill to become a daring sniffing and hunting dog. REAL POLICE SNIFFING DOG CRIME CHASE SIMULATOR: CRIME CITY is surely going to enliven your inner police pursuit. Believe it! There has never been such an awesome 3D real dog simulator.It’s really an incredible crazy dog simulator for those looking to have fun as a doggy. This game is about police vs robbers. In this game you are the police pursuit trained German shepherd dog. Police Officer with sniffing dog will help you to assign missions. As a police hunting and sniffing dog your real mission is to chase down the thieves, robbers and criminal who are trying to escape and getting away after breaking into the city and running fast through the streets. For instance, while most criminals are aware of what a search and rescue dog does, so robbers will try to flee away after sighting you. You need to run speedily and catch them by following the arrow on the roads. Take control of the husk and hunt down the convicts of crime city. Fun sounds and exciting real animations are included. Police Dog & Prisoners rivalry is getting serious. Track criminal suspects and missing persons in various challenging missions with your fellow police officers. Trained as the professional cop dog you are playing as the real police dog chasing criminals. Sniff, chase and find wanted criminals and illegal items.Catch those delinquents with weapons and illegal items. Feel the thrill ramp up when the bad guys escape. Chase them until they give out!Take a pick from your favorite breeds, including German Shepherd and Rottweiler. Enjoy the excitement with this excellent game play in a realistic 3D city environment. sniffing dog assisting the police officer and other cop individuals to trace suspects.The city has turned into the crime town and you have to use your sniffing abilities to track down criminals and secure the airport. Trained as a Cop Kutta / dog to find clues to track criminals. Some robbers and criminals may try to break inside with illegal items. Catch them before they end up with the criminal activity. Police dog airport crime chase is a thrilling action game where you play as Kutta dog to chase and catch criminals. Police chase and crime town games are popular but playing as a cop dog is even more thrilling. Some people might be carrying some suspicious item in their luggage. They might run away when sited so be fast to catch them. Play ultimate criminal pursuit and don’t let the city turn into a crime place. Hunt down criminals as you are a trained German shepherd.Those who are looking to play dog simulator in a whole new way can play police dog airport crime chase. Accompany bomb disposal squad to find and diffuse the bomb. Beware of the criminal’s eye while on the mission to save the hostages from his custody. You have to play smart and clever to rescue all the tourists and passengers in trouble. 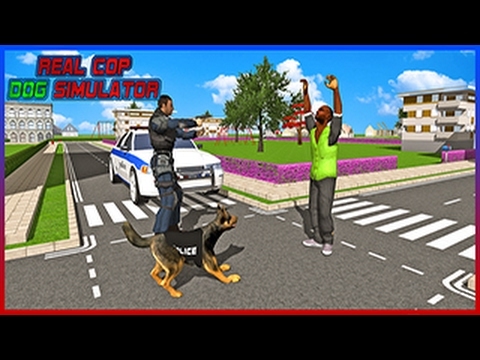 You will find full thrilling and entertaining missions while proceeding to the next level.This Real Cop dog animal simulator has been designed for all ages. Just grab it now and have fun!